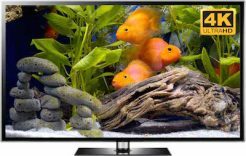 If you are looking for a fish tank to show on your Ultra HD SMART TV, this 4K aquarium video is the best option. The vibrant colors really pop on big screens. The living coral and exotic fish make this a stunning, life-like aquarium. Watch the promo clip below. Then choose your aquarium download option. Please note: We have re-encoded this video with relaxing 5.1 surround sound in the new HEVC H.265 video codec which is much nicer than the original promo clip on YouTube. The sound you hear below is what you will actually hear in all downloads. We have now compressed the 4K UHD version to 1.2 GB, which is a much more manageable file size than the previous 3.5 GB. The video quality is just as amazing as before, but now steadier when streaming and much faster to download. 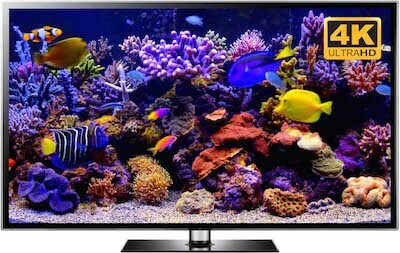 Coral Garden is one of our most entertaining and vibrant aquarium screenavers. This Ultra HD aquarium video oozes color, life and detail. 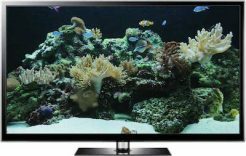 If you have a UHD SMART TV the picture quality of the 4K aquarium video is spectacular. The amount of detail is unrivalled on a large UHD SMART TV. With the new surround sound audio this is a very enjoyable and immersive virtual aquarium experience. Coral Garden comes a very close second to having your own awesome fish tank. 4K Ultra HD is really opening the door to the realism that we strive for. The image is becoming so real that some people may be convinced that this is the real thing, at least on first glance. Coral Garden is aptly named after the lovely, well cared for living corals. The aquarium is owned by a popular vlogger on Youtube, who instructs people on how to create, grow and care for attractive, fully featured marine aquariums. He is also a Uscenes videographer and we have been able to film this $20,000+ aquarium a few times. This is by far the most popular version. This 4K aquarium video also features beautiful fish besides the many corals on the real coral reef. There are a few characters you will recognize from our favorite underwater movie Finding Nemo. This includes Clownfish, Hippo Tang and lots more colorful marine fish that you could imagine swimming around coral reefs in the tropics. We have listed all the fish and corals in the “More” tab. You will also spot a Blue Tang who represent Dory from the movie Finding Dory and Finding Nemo. You can download this virtual aquarium in 4K UHD or choose a Full HD version instead. 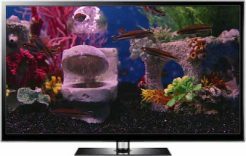 Both come as a 20 minute MP4 video to create your own SMART TV aquarium. The Full HD video is downscaled from the 4K video, which means the details look superb. 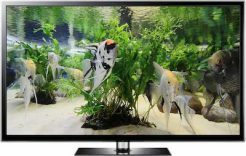 This is not only our best 4K aquarium video, it is probably also our best selling Full HD aquarium video too. Besides the video you can also choose to download a 3 minute self looping screensaver version. This comes in both a Microsoft Windows version and an Apple Mac OS X version. The aquarium screensaver will loop by itself just like any other screensaver until you start using your laptop or PC again. Again you can choose a 4K screenaver or HD. Support for multiple monitors- choose which screens to show the screensaver. Independent volume control from your system’s master volume. The option to set a screenshot as your desktop wallpaper in Ultra HD resolution (3840 x 2160 pixels). Uscenes MP4 videos are simply videos, so you will need to download them to your PC, then transfer them to your TV with a USB memory stick, or SD card. Then simply use the in-built media player to play the video with Repeat selected to keep it looping. 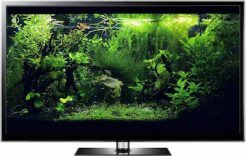 Think of it as a manual aquarium screensaver for your television. You can also use streaming devices like the 4K Apple TV, Google Ultra Chromecast or media player boxed to stream the video to your TV. My favorite aquarium video. Looks amazing on my UHD SMART TV. The kids love it too, even Nana enjoys it- she thought it was real the other day hehehe. The best aquarium is the correct title for this. Heavenly! My most used aquarium screensaver, both on my 4K TV and on my laptop monitor. Love the colors of the fish and corals. Q Will these fit on an ultra wide monitor? Q Will this screensaver run on Mojave? A Hi Joao. Yes you can certainly licence our videos for live shows, but that is something we would do privately. The website is just for home use purposes. I will send you an email asking about the intended use then come back to you with a reasonable fee, then we can draw up a licence agreement. A Hello, we have no experience with those 4K TVs. I have looked them up and they seem to be Roku TVs. I assume you can plug in a USB stick or stream from your home media center, but I don't know for sure. I recommend you check if they support 4K HEVC H.265 MP4 videos and whether you can play videos from a USB or your computer. If not we have a subscription channel on Roku you could use. A Hi Lynn. These are digital downloads, we do not sell any physical products. A Hi Jay, the file you want is "4K Ultra HD MP4 Video $23". That will look amazing on your new OLED 4K TV. A Hi Claudia. Many people have a media center app on their SMART TV, which streams videos from their storage e.g. an external hard drive connected to a computer. An example is Kodi. Others use media player boxes to do the same thing e.g. the Apple TV. The simplest way if you don't have these is to download the video to your computer, copy it to a USB memory stick or SD card, then plug that into your TV. Usually, that will bring up the TV's inbuilt media player automatically, but you may need to scroll through a window or two to find it. Be sure to select Repeat (or Loop on Google Chromecast) so that it plays continuously. If you are still unsure feel free to download our sample clips to test it: https://www.uscenes.com/try-uscenes-downloads/ and if there is something specific to your situation please email us, as we are always happy to advise. A Hi Matthew, thanks for buying the Mega Deal. Usually, you would immediately be redirected back to our website after paying, where you will be given access to the download portal. Also, an email would be sent with the information at the same time. I have sent you a personal email with your access details. Perhaps there was a delay with your card and the email went to your junk folder. This is very rare and most likely just a quick check by your bank, which delayed things. Full HD MP4 videos are approx. 20 minute 1080p footage suitable for all TV screens. Approx. 500 MB to 1.3 GB download. We use the H.264 codec which allows us to compress the files to a manageable download size, whilst maintaining excellent quality. 4K Ultra HD MP4 videos are around 1.2-1.6 GB for UHD televisions. We have encoded these videos in the superior H.265 (HEVC) codec, which means faster download speeds. The computer screensavers are self looping 3 minute versions in Full HD for Windows and Mac PCs and laptops (approx. 100 MB to 230 MB). The 4K Ultra HD screensavers are also 3 minutes and loop automatically (approx. 200 MB to 350 MB) . Some of the MP4 videos are looped to make up the 20 minutes. For more technical information see our FAQ page, or Blog for help with media players. Please note: our products are all virtual, downloadable files. We do not sell DVDs or Blu-rays. If you are unsure if your devices can play our formats; please click here to try quick samples. We film and encode all our relaxation videos in 4K Ultra HD (or 1080p Full HD for older videos). Each product offers downloads for any screen, which includes an MP4 video which can be looped on TV and computer screens. Also screensavers for Windows and Mac computers.